A heavily armed gunman opened fire on a high-speed train travelling from Amsterdam to Paris before being overpowered by three Americans, two of whom were soldiers. Two people were injured in the attack, including one of the Americans – who was hospitalised with serious injuries to his hand and needed surgery. The US president, Barack Obama, described the men as “heroic” following the attack on Friday. A British passenger, Chris Norman, helped the Americans tie up the suspect. 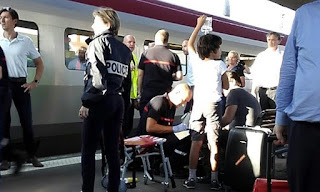 French anti-terrorist police are now questioning the gunman, who was arrested after the train made an emergency stop at the station of Arras, near the French-Belgian border. The motive behind the attack was not immediately known, although French prosecutors said an inquiry was being launched by counter-terrorism investigators. According to early briefings, the gunman, 26, was known to French intelligence services and was Moroccan or of Moroccan origin. The shooting happened just before 6pm in the last carriage of the TGV train, which was carrying 554 passengers. The man had several weapons in his luggage, including a Kalashnikov, an automatic pistol and razor blades. Two of the Americans were in the military, their travelling companion and childhood friend Anthony Sadler, a senior at Sacramento State University, told Associated Press. 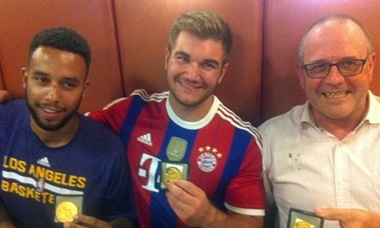 The injured American was named as Spencer Stone, from Sacramento, California, and the other man with them was Alek Skarlatos, of Roseburg, Oregon. “We heard a gunshot and we heard glass breaking behind us and saw a train employee sprint past us down the aisle,” Sadler said. The trio then saw a gunman entering the train car with an automatic rifle, he added. Norman helped tie the gunman up while Stone helped another passenger who had been wounded in the throat and was losing blood. Norman, a 62-year-old consultant who lives in France, sad he had initially ducked down in his seat when he saw the man enter the carriage carrying a gun. “I came in at the end and I guess just helped get the guy under control at the end of it all,” he told French reporters. “We ended up by tying him up, then during the process the guy actually pulled out a cutter and starting cutting Spencer. The French actor Jean-Hugues Anglade, who appeared in the 1986 cult film Betty Blue with Beatrice Dalle, was also lightly injured in the incident. He was reportedly hurt while breaking the glass to activate the train alarm. The suspect is believed to have boarded the train in Belgium and the shooting took place as the train was travelling through Belgian territory. The Belgian prime minister Charles Michel tweeted his condemnation of what he called the “terrorist attack”. Je condamne l'attaque terroriste dans le @thalys_fr et fais part de ma sympathie pour les victimes. France’s interior minister, Bernard Cazeneuve, who rushed to Arras, said the American passengers “were particularly courageous and showed great bravery in very difficult circumstances”. “Without their sangfroid, we could have been confronted with a terrible drama,” he said. He described the incident as an act of “barbaric violence”. The French prime minister, Manuel Valls, also expressed his gratitude to the soldiers. The French president, François Hollande, said: “All is being done to shed light on this drama.” He had spoken to the Belgian prime minister and the two countries were cooperating on the investigation. “The passengers are safe, the situation has been brought under control,” said the train operator Thalys, jointly owned by the national rail companies of Belgium, France and Germany. Passengers in other carriages described on French TV how the train braked several times before pulling into the station, where the man was arrested. Train alarms had gone off on board and passengers in other carriages had heard staff communicating with each other by loudspeaker about an ongoing incident just before the train pulled in. Passengers arrived early on Saturday at Paris’s Gare du Nord station and were greeted by a large group of SNCF staff with water and meals and help finding hotels and taxis. France remains on high alert after January’s terrorist attacks on the satirical magazine Charlie Hebdo and a kosher supermarket in Paris, in which gunmen killed 17 people. And in May last year, four people, including two Israeli tourists, were killed when a French gunman opened fire at the Jewish museum in Brussels.